We prefer to think of treats as snacks; something delicious, and nutritious, that doesn't break your dog's healthy diet! Healthy dog treats are useful for trust, bonding, training, and provide the positive encouragement that all dogs need. By feeding healthy, non-processed, lower-calorie treats, you shouldn't have to worry as much about adding treats to your dog's diet. However, with treats that may fall more into the category of "junk food",it's really easy for these extra bites to throw off an entire diet. 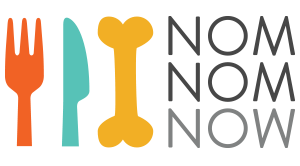 At NomNomNow, we portion your dog's meals to provide them with the exact calories they need every single day. By adding a few treats into their routine, you may notice your dog is able to stay within their target weight range. However, if you notice your dog gaining weight, you may need to either reduce treat intake, find healthier treats (though hopefully, your dog is enjoying healthy treats from the start! ), and if need be, reduce portion sizes. Consider all natural chicken jerky, sweet potato jerky, or fresh vegetables such as spinach, carrots, and cucumbers as healthy treats that you can feed your dog throughout the day.